We will make a snapshot of the AdventureWorks 2008 sample database. All the code in this article is based on SQL Server 2008. You will need to modify the updates we use later in our stored procedure to make it compatible with 2005. You can find all of the AdventureWorks sample databases on Microsoft's CodePlex site. Assuming you have Adventureworks installed, open up query analyzer and let's get started by creating a snapshot of Adventureworks. Simple enough here. We're creating a snapshot of the database on our C drive and we're calling it AdventureWorks_PreTestSnapshot. This will give us a Simple enough here. We're creating a snapshot of the database on our C drive and calling it AdventureWorks_PreTestSnapshot. This will give us a read-only copy of AdventureWorks and take up very little space on our drive. Snapshots use copy on write, which means when a page is updated in the primary database, in this case AdventureWorks, the old page is written to the snapshot database so your copy remains an exact image of your data at the time the snapshot was taken. Let's take a closer look at the code. First (Line 4) we're making sure that our test can't run if there isn't a snapshot. We're doing this to keep from shooting ourselves in the foot. It's a real drag to step on your test scenario and have to reset it later when you want to run it again. The snapshot, as you'll see later helps us avoid this problem. Next (Lines 10 & 11) we update top 5 records in the Sales.Customer table with today's date and then set a message variable that we'll use for our custom event. Finally we get to the good stuff in line 12, we raise a custom event that profiler will pick up. 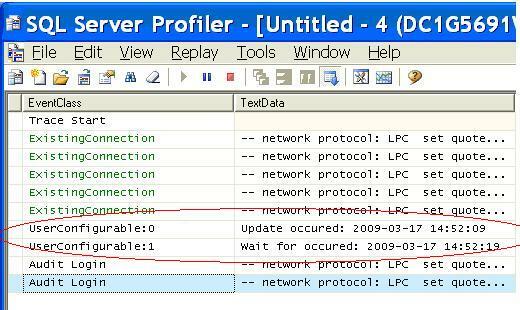 Profiler defines 10 user configurable events defined as User Configurable:0 through User Configurable:9. These events correspond with eventid's 82-91 so for example if you raised eventid 82 in your procedure you would use the user configurable event 0 in your profiler trace. We'll get to that in more detail in a little bit. We then put a waitfor delay in line 13 so we can see a time span other than a few milliseconds between our sp_trace_generateevent on line 12 and line 15. Now let's change applications and take a look at setting up a trace in profiler to capture the generate event calls on line 12 and 15. Open up Profiler and select File>>New Trace and connect to your database instance. Click on the events selection tab and click on the checkbox for “All Events”. Scroll all the way down your list of events and expand “User Configurable”. Since we're raising events 82 and 83 in our stored procedure you should check the box to the left of UserConfigurable:0 and UserConfigurable:1 to add them to your trace. You can add or remove other events as you see fit. When you're ready, go ahead and click the “RUN” button to start your trace. Now we want to run some code in query analyzer to test out our user configurable events. Execute the code below to run the stored procedure we created earlier. When the code has completed running you should see something similar to this in your profiler results. Notice you now have 2 events that profiler was able to capture but did not throw errors in query analyzer when your code was executing. For complex procedures with variations in how they execute this is a real boon in debugging. Now that we have run our test let's take a look at resetting the database to wipe out what we did. This is useful scenarios where we've changed code and need to execute a retest. First we can see that we now have 5 updated rows in the AdventureWorks database. Now we can verify that our AdventureWorks database has been reset and we're ready for another round of testing. We should now see 0 rows changed since we restored our clean copy. Finally here is the code for you to cleanup the snapshot you created when you're done with testing. I hope this article helps you simplify some of your debugging and testing drudgery and makes it a little bit easier next time you have to dig under the covers of some of your more complex procedures.